By now you’ll probably know, I’m all for skincare. Without a good skincare routine, I don’t feel prepared, that can be for my day ahead, sleep or before doing my make-up. Being that within my job, make-up is a daily thing it’s even more important that I pay attention to my skin. I’ve used Beuti skincare before, not tested on animals & it’s free from chemical nasties. Also this brand is one of the Duchess Kate Middleton’s favourites, so if it’s good enough for a Royal it’s good enough for me. It also lets you know how safe these products are for pregnant women! 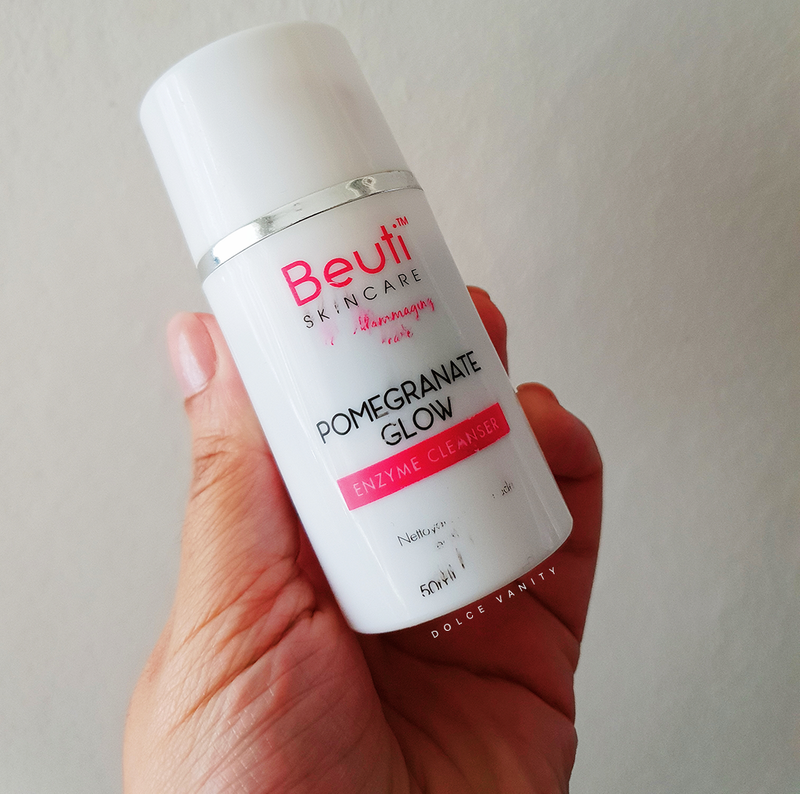 A while ago I was sent this Pomegranate Enzyme Glow Cleanser by Beuti. As soon as I read Enzyme, I’m sucked in. Enzymes in skincare help to exfoliate the top layer of our skin to reveal a smoother and more radiant appearance. The pomegranate ingredient in this, delivers the benefits of glycolic acid (acid freak here) but without the irritation some may get with that particular acid. This also contains a blend of rose clay, copaiba balsam that work to smooth and refine the skin whilst soothing and protecting against inflammation. Consistency of this cleanser is a gel balm hybrid, very different, as I normally deal with oils, but not a lot of gels or balms. I only need a couple pumps into my hand and I apply it onto the skin in circular motions, paying attention to the places I know need that real good exfoliating, I get some water onto my fingertips and begin rubbing it onto the face and the consistency changes into that of a more milky cleanser. This cleanser can also be used as a mask for a more intense treatment. When I read about the mask part, I found it more beneficial for me than using it as a cleanser. Don’t get me wrong, using it as a cleanser is nice because it can be used AM/PM without any redness making it fine to use before any occasion for me but I love to get an intense outcome from my skincare routine and this is like a 2-in-1. Can’t complain. My skin is brighter, I’m always complimented on my skin which I feel is maybe a combination of blessed genes and also good skincare, exfoliation is my best friend with skincare and I make sure that whatever I use whether intense or gentle it’s giving me that benefit, just like this does. The pump bottle for me is good because when I use the pump, it doesn’t spurt out a lot of product so there’s no fear of wasting, my only slight nit-pick was the print used for the bottle because if my hands are wet or have oil on, it’s managed to remove the print off the front which if I’m paying between £30-£40 for a bottle, I’d not expect that but rumour has it, that the bottle is getting a really good remodelling, regardless of old or new packaging it doesn’t take away overall the results from this cleanser.